What is the best EVAP smoke machine on the market in 2019? The cost of these units varies and while some are suitable for commercial use, you might require something more affordable for the home garage. Well in this review round up we have carefully selected a range of top rated models to suit all budgets. For our findings at a glance just head to the table below. For an in depth analysis of each smoke machine, plus a dedicated buyer’s guide, keep on reading. As with any industry there are different models, makes, and brands of EVAP smoke machines available. However, these can be ranked and rated based on their design quality, work performance, and cost-benefits advantage. Based on this criteria, we have selected 5 top rated EVAP smoke machines for review. The OTC 6522 leakTamer is a high-performance battery-powered EVAP Smoke Diagnostic Machine that can reliably detect and locate leaks in the EVAP system, vacuum system, exhaust system, and oil system. It’s competitive price point makes our top pick ideal for both commercial and private use. The unit can reliably detect and locate approximately 80% of the top fault codes in EVAP systems. It uses high-quality UltraTrace UV dye to make the dyed smoke visible under UV light. It also comes with an ultra-modern smoke flow control that can adjusted by the user to suit different applications. Additionally, this model can detect micro-leaks whose diameter is 0.01inch. This compact and portable LeakTamer can also be used by HVAC (heating-ventilation and air-conditioning) specialists to detect leaks in HVAC systems. This model uses patented technology to deliver an OEM-approved smoke compound which can be dyed to improve visualization, with the easy-to-read flow meter allowing the user to quickly estimate the size of the leak. To control how much flow smoke is fed into the EVAP system, LeakTamer comes with a precise (smoke) flow control. This product is designed and made by OTC Tools, a subsidiary of Bosch Automotive Service Solutions that specializes in manufacturing high-quality electronic diagnostic equipment for vehicles. The UTC is compact, yet powerful, EVAP smoke machine that weighs about 9.5pounds which makes it quite portable and the user can easily carry it around the workplace. The main unit is 9inches long, 7inches wide and 14inches tall. This model is shipped as a package that contains the smoke machine (the LeakTamer unit), service port adapter, cap plug adapters, UV glasses, exhaust adapter cone, Schrader installation tool, laser pointer with white/UV combination, and an 8-ounce UltraTrace-UV smoke producing solution. The LakeTamer comes equipped with 3 size-AA batteries which are fitted in the battery compartment. This unit requires 12volts direct-current(DC) to run, with its amperage rated at 15amperes. This smoke machine feeds the smoke at a rate of 12liters-per-minute with the supply pressure maintained at 0.47psi. The optimal temperature range for using the LeakTamer is 0degrees centigrade to 60degrees centigrade. The machine also comes with a 10foot supply line, a 10foot remote starter cable, and a 10foot power supply line. The power supply line has two cables – the red and black cables – with crocodile clips at the end, and they are used to connect the machine to a car battery when the AA batteries run out of power. The supply line is fitted to the gas cylinder containing an inert gas like proprietary shop air, nitrogen and carbon dioxide. The components of LeakTamer unit are described hereafter. To begin with, there is the on-off switch located at the top of the machine and it is used to turn the unit on or off. Also at the top is a dipstick which is used to show the level of the smoke solution in the machine. Near the on-off switch are 2 indicator lights – the power indicator lamp which lights up when the unit is connected to a car battery, and the smoke indicator lamp which lights up when the vapor is being produced by the unit. On the topmost edge of the unit is the hook insert which is used to hang the unit. The supply hose delivers the vapor to the EVAP system, with the vapor flow volume being controlled by the flow control valve. On the front panel of the unit is a flow meter which shows if the vehicle has a leak, and is thus used as a quick pass-or-fail indicator for leaks. There is also the water separator(filter) which drains liquid so as to ensure only air flows through the supply hose. This model also comes with a Cap Plug Kit which seals the intake/inlet duct of the engine under test. There is also a standard EVAP Service Port Adapter that can connect the LeakTamer unit to the EVAP service port of the vehicle. Likewise, there is the Schrader installation tool which is used to install or remove a Schrader valve placed in the EVAP Service Port. This installation tool has left-handed threads. Another component is the diffuser which helps the user locate water and wind leaks. There is also the torch-like Combination White/UV Light device which is used to locate vapor dyed with fluorescent UV dye. Another key component is the Adaptor Cone which can be used to deliver the vapor into the exhaust and inductions systems of the vehicle, as well as any other system where the cone can fit. The vapor-producing solution is shipped in 2 UltraTraceUV bottles, which is enough for performing about 600tests. The model benefits from a 12-month warranty guaranteed by OTC Tools. Uses UltraTrace UV dye to color the smoke vapor. Vapor-producing solution enough for 600tests. The price point might be beyond the budget of some home users. The OTC 6522 LeakTamer is a high-performance battery-powered EVAP Smoke Diagnostic Machine that can reliably detect and locate leaks in the EVAP systems, as well as detect and locate 80percent of the top fault codes in EVAP systems. It uses high-quality UltraTrace UV dye to make the dyed smoke visible under UV light. The superior design quality, outstanding work performance, and a clear cost-benefits advantage of OTC 6522 LeakTamer makes it, in our opinion, the best EVAP smoke machine available today. The Smoke-Pro Total-Tech is a high-quality, commercially focused, battery-powered EVAP Smoke Machine. The unit can detect and locate leaks in the EVAP system, and is designed as a complete diagnostic solution for EVAP leaks. It feeds the EVAP system with a thick smoke which can be easily seen when it escapes from a leak in the EVAP system. It also supports air dual-stage testing which means that it can use smoke vapor or non-dyed proprietary shop air to locate leaks. It also comes with a pressure gauge. This model can detect leaks whose diameter is 0.01inches. Likewise, this compact and portable machine uses patented technology to deliver an OEM-approved smoke compound, while its easy-to-read flow meter allowing the user to quickly estimate the size of the leak. This product is designed and made by Redline Detection. The model weighs about7pounds which is lighter than the OTC 6522 LeakTamer. It is designed to be portable so that the user can easily carry it around the workplace. The cylindrical body of the machine has a diameter of 5inches and it is 11inches tall. Similar to the OTC 6522 LeakTamer, the Smoke-Pro model is shipped as a package that contains the smoke machine, service port adapter, cap plug adapters, exhaust adapter cone, Schrader installation tool, and an OEM-approved smoke-producing solution. Also included in the Smoke-Pro shipping package are an instructional DVD, a halogen inspection light and an Accessory Storage Case. The Smoke-Pro requires 12volts DC to run. It has 2 operating modes – the air-only cycle and the smoke cycle. This machine feeds the smoke at a pressure of 0.47psi. The optimal temperature range for Smoke-Pro is -17degrees centigrade to 42degrees centigrade. The model comes with a supply line and a power supply line. This power supply line has two cables – the red and black cables – with crocodile clips attached at their ends, and they are used to connect the machine to a car battery. The supply line is fitted to the gas cylinder containing an inert gas like proprietary shop air, nitrogen and carbon dioxide. First of all, there is the on-off switch for turning the unit on or off. There is the power indicator lamp which lights up when the unit is connected to a car battery. On the top of the unit is the hook insert which is used to hang the unit. The supply hose delivers smoke vapor or air to the EVAP system, with the flow volume being controlled by the flow control valve. On the side of the cylinder is a flow meter which shows if the vehicle has a leak, and is thus used as a quick pass-or-fail indicator for leaks. The Smoke-Pro comes with a Cap Plug Kit that seals the inlet duct of the engine. Its standard EVAP Service Port Adapter connects it to the EVAP service port of the vehicle. Likewise, its Schrader installation tool is used to install or remove a Schrader valve placed in the EVAP Service Port. Furthermore, the Adaptor Cone can deliver vapor into the exhaust and inductions systems of vehicles, as well as any other system where the cone can fit. Finally, the Smoke-Pro model benefits from a 12-month warranty guaranteed by Redline Detection. Has 2 operating modes: the air-only cycle and the smoke cycle. More expensive than OTC 6522 LeakTamer, however this unit is directed at the commercial user. 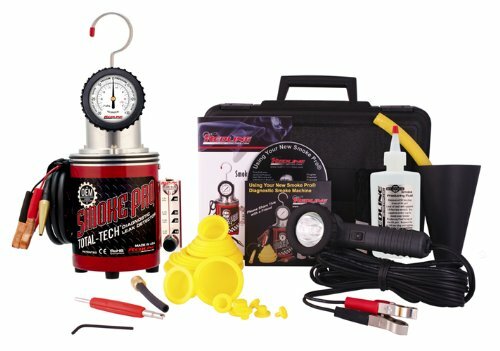 The Smoke-Pro Total-Tech Leak Detector Kit is a high-quality battery-powered EVAP Smoke Machine that is designed for commercial use as a complete diagnostic solution. It feeds the EVAP system with a thick smoke that can be easily seen when it escapes from a leak in the EVAP system. It also supports air dual-stage testing. For those with the budget this is an excellent unit that is well worth considering. The Autool SDT206 is a portable and affordable high-quality battery-powered EVAP Smoke Machine that features a flow-meter pressure gauge, and can detect and locate EVAP leaks. It is designed to detect leaks in pipe systems in vehicles, boats, motorcycles; and can check the fuel system and air-intake system for leaks. It uses a special oil to produce the smoke vapor. It also comes with a special adapter which allows it to fit into an EVAP system. Likewise, it comes with an inbuilt air compressor and an instant smoke generation mechanism. It also has a self-protective system that prevents overload. This model also features an adjustable flow-meter, which along with the pressure gauge, allows the user to adjust the smoke output. It comes with 2 oil bottles. It also uses patented technology to deliver an OEM-approved smoke compound into the pipes being tested, while the easy-to-read flow meter allows the user to easily estimate the size of the leak. This model is designed and made by Autool. The machine weighs about 9.92pounds which makes it nice and portable as the user can carry it around the workplace. This model is shipped as a package that contains the smoke machine, a hook, taper plug, end cap kits, taper pipe and a user manual. The Autool SDT206 requires 12volts DC to run, and comes with power cables for connecting it to the car battery. It is also shipped alongside its supply hose which delivers the smoke to the piped system being tested. This machine has an on-off switch which is used to turn the unit on or off. At the top, there is an oil filter which ensures that impurity-free oil is fed into the machine. The machine also has 2 indicator lights – the power indicator lamp which lights up when the unit is connected to a car battery, and the smoke indicator lamp which lights up when the vapor is being produced by the unit. The hook can be fitted at the top of the machine, and it is used to hang the unit. The amount of vapor flowing out of the machine can be controlled using the flow control valve. On the front panel is the flow meter which shows if the piped system has a leak. This model can detect leaks as small as 0.02inches in diameter. Cannot be used with gas cylinders. Not as effective as OTC 6522 LeakTamer in detecting and locating EVAP leaks. The Autool SDT206 is a compact, portable and affordable high-quality battery-powered EVAP Smoke Machine that features a flow-meter pressure gauge, and can detect and locate EVAP leaks. It is designed to detect leaks in pipe systems in vehicles, boats, motorcycles; and can check the fuel system and air-intake system for leaks. However, compared to our top pick OTC, this unit is less efficient at locating small EVAP leaks. The Smoke-Tek Leak Detector is a well-designed and affordable, low budget battery-powered EVAP Smoke Machine. The unit atomizes mineral oil to produce thick smoke which is used to detect and locate EVAP leaks. It is designed to detect leaks in piped systems in automobiles. It uses a special and safe oil to produce the smoke vapor. This vapor does not contain toxic particles that can harm the body or erode the piped systems in the vehicle. This model also comes with a special adapter which allows it to be fitted into an EVAP system. This allows the user to check for leaks in any EVAP system. It also uses patented Smoke-Tek technology to deliver the OEM-approved smoke compound into the system being tested, while the easy-to-read flow meter allows the user to easily estimate the size of the leak. It can also detect leaks in gaskets of engines. This model is designed and made by Smoke-Tek. This compact and lightweight smoke machine weighs only 5pounds, which makes it one of the most portable units in our top 5. This model is shipped as a package that contains the smoke machine, medical-grade mineral oil, taper plug, taper pipe and a user manual. Baby oil can be used as a substitute for the mineral oil. The Smoke-Tek Leak Detector requires 12volts DC to run, and comes with a power supply line which houses 2 power cables featuring crocodile clips at their end for connecting the machine to a car battery. It is also shipped alongside a durable and high-quality supply hose which serves to delivers the smoke vapor to the system being tested. This machine has a pressure regulator which protects it from being damaged by high-pressured air when it is connected to an air compressor. The pressure regulator serves to reduce the air pressure to safe levels that can be withstood by the machine. The amount of smoke flowing out of the machine through the supply hose can be adjusted using the flow control valve. The Smoke-Tek Leak Detector has an on-off switch which is used to turn the unit on or off. There is also an oil filter which ensures that impurity-free oil is fed into the machine. At the top is a hook which is used to hang the machine in the workshop. Unlike the other EVAP smoke machines reviewed above, the Smoke-Tek Leak Detector lacks a dedicated flow meter. This model can detect leaks as small as 0.02inches in diameter. The Smoke-Tek Leak Detector is a well-designed, portable unit that is designed to suit the home user in that it is extremely affordable. It is a battery-powered EVAP Smoke Machine that atomizes mineral oil to produce thick smoke which is used to detect and locate EVAP leaks. This is a heavy-duty, high-performance battery-powered EVAP Smoke Machine that can efficiently detect and locate leaks in an EVAP system. It has reliably detect and locate almost all leak-related OBDII-EVAP fault codes in EVAP systems. Like the OTC 6522 LeakTamer, it uses high-quality UltraTrace UV dye to make the dyed smoke visible under UV light. Likewise, it features an efficient smoke flow control that can adjusted by the user to suit their different needs. This model can detect micro-leaks whose diameter is 0.01inch. Additionally, it uses patented technology to deliver an OEM-approved smoke compound that can be dyed to improve visualization, while its easy-to-read flow meter allows one to easily estimate the size of the leak. Its precise smoke/vapor flow control manages how much smoke is fed into an EVAP system. This model is designed and made by Vacutec. This powerful, EVAP smoke machine weighs about 32pounds which makes it the heaviest model in this review. Likewise, it is not as portable as the other 4 models reviewed above but 2 workers can comfortably move it around the workplace. The machine unit is 20inches long, 13.5inches wide and 22inches tall. This model is shipped as a package that contains the smoke machine, a service port adapter, a cap plug adapters, an exhaust adapter cone, a Schrader installation tool, and the UltraTrace-UV smoke producing solution. The Vacutec 2000E requires 12volts and 15amperes of DC power to run. It feeds smoke into an EVAP system at a constant supply pressure of 0.47psi. It also comes with a supply line, a remote starter cable, and a power supply line. The power supply line houses two cables with crocodile clips at their ends which allows them to be clipped to a car battery. Its supply line can be attached fitted to the gas cylinder containing an inert gas like argon, proprietary shop air, nitrogen and carbon dioxide. The Vacutec 2000E machine has an on-off switch which turns it on and off as required. There are also 2 indicator lights; the power indicator lamp and the smoke indicator lamp. This model does not have a hook as it cannot be hanged but needs to be placed on the floor. Its supply hose feeds smoke vapor into an EVAP system, with the vapor flow volume being controlled by the flow control valve. On the top-half of the front panel of the machine unit is a flow meter which shows if the vehicle has a leak. This machine also features a water separator. The vapor-producing solution come in two UltraTraceUV bottles, which is adequate for performing about 500tests. This model benefits from a year long warranty guaranteed by Vacutec. Vapor-producing solution enough for 500tests. More expensive than OTC 6522 LeakTamer. Thw Vacutec 2000E is a heavy-duty, high-performance battery-powered EVAP Smoke Machine that is firmly directed towards the commercial market. It can reliably detect and locate almost all leak-related OBDII-EVAP fault codes in EVAP systems, making it ideal for professional use. However, with that comes the price. Vehicle emissions cause air pollution, and they contribute significantly to the scourge of pollution that affects cities and other urban settlements. From 1971, the US administration mandated car manufacturers to produce cars with a low emission signature and this led to the construction of fully-sealed fuel systems that could not vent fuel vapors to the atmosphere. The use of sealed fuel systems is regulated and guided by the Evaporative emissions control protocols. Starting from 1996, new vehicle models using gasoline engine came equipped with an Evaporative Emission Control System (also called EVAP). EVAP is designed to prevent gasoline(petrol) vapors from escaping the fuel system, especially the fuel tank, and rising into the atmosphere. An EVAP system is a low-maintenance emission control system that uses a special Check-Engine light to alert the user to faults within the EVAP system. A faulty EVAP system also prevents the car from passing an Environmental Protection Agency(EPA)-approved test called the OBD-II plugin emissions test. The On-board diagnostics II (OBD-II) EVAP monitor allows the vehicle to run self-diagnostic checks for vapor leaks, and if a leak is detected, the OBDII-EVAP system identifies the specific type of defect according to set fault codes, and then uses the right fault code to turn on the malfunction indicator light called the Check-Engine light, which also displays the fault code. Even so, why is EVAP a critical system in the car? The answer relates to the high volatility of gasoline. Gasoline is a highly volatile fuel made up of different hydrocarbons. The light hydrocarbons including the higher paraffins, aldehydes, olefins, and aromatics, evaporate readily at room temperature, with their evaporation rate increasing in warm environments. This means that when the vehicle is stationary, these light hydrocarbons evaporate and escape into the atmosphere where they react with air in a photochemical reaction catalyzed by sunlight that results in the formation of smog. Some hydrocarbons such as aldehydes can form instant smog without undergoing any photochemical reaction. This form of vapor leaks accounts for about a fifth of the total pollution caused by a car. It is for this reason that the EPA requires gasoline-fueled vehicles to have an EVAP system. An EVAP system averts vapor leaks by ensuring that the entire fuel system from the tank to the carburettor bowl is fully sealed. The EVAP system allows vapor to be routed through vent lines to an EVAP storage canister where the vapor are stored till when the vehicle is started and its purge valve is opened to allow the stored vapor to be siphoned off into the intake manifold that routes the vapor to the engine. The main parts of an EVAP system are the fuel tank, the gas cap, the liquid vapor separator, the EVAP cannister and the vent lines. The fuel tank must be vented as this allows air to replace the volume of fuel sucked by the fuel pump, thereby preventing negative suction pressure from developing inside the tank and causing it to collapse. The gas cap can contain a spring-loaded vacuum-relief or pressure-relief valve that allows for venting of the fuel tank. Still, the latest models of gas caps lack a vent. The liquid-vapor separator is located atop the fuel tank and serves to prevent liquid gasoline/petrol from escaping the fuel tank and entering a vent line. This separator therefore ensures that only vapor flows into the vent line. The vent line carries the vapor to the EVAP canister – a small container filled with activated charcoal that absorbs vapor and allows the vapor to accumulate in the canister which doubles as a vapor storage device. What happens when a fault enters the system? The EVAP system can develop a fault which is usually detected by the EVAP-OBDII monitor. Each fault has been assigned a specific fault code from the available fault code range. This fault code range starts from the P0440 code and ends at the P0457 code. A fault code of interest is the P0442 code which indicates that there is a small leak in the system. These small leaks are usually less than 0.02inches in diameter (about the diameter of a pin-prick) and are difficult to locate visually. To locate leaks as described in the previous section, a special tester called an EVAP smoke machine is used. The EVAP smoke machine is a specialized device that atomizes (or vaporizes) mineral oil, colored inert gases, or proprietary shop air, and then feeds the resultant vapor, which can be complexed with ultraviolet dye, into an EVAP system under low pressure. This vapor circulates and fills the fuel system, and at the leak location, it escapes into the atmosphere which allows the user to visualize where the leak is. The ultraviolet (UV) dye allows one to see the vapor under UV light. This machine not only detects small leaks, but can also be used to locate moderate leaks (about 0.04inches in diameter, fault code P0456) to gross leaks (fault code P0455). These smoke machines require electricity to operate, and some come with their own batteries while others require the user to connect them via crocodile clips to the car battery so that they can use the car battery to power their operations. When using an EVAP smoke machine that does not come with its own gas (or fluid) tank and thus requires one to use an external gas cylinder, it is recommended that one uses Argon, inert Nitrogen or Carbon Dioxide for the EVAP system testing. This is because ordinary shop air contains oxygen and when the air is pumped into the fuel system by the smoke machine, it ends up reaching the fuel tank where it creates an oxygen-rich vapor/fume environment that can readily be ignited by sparks produced by the fuel pump or for the fumes in the vent line, a spark from the solenoids located adjacent to the EVAP canister. However, if an inert non-combustible gas such as Argon, Nitrogen or Carbon Dioxide is used, it creates a stable non-volatile fume environment in the fuel tank. To fit the external gas cylinder to the EVAP smoke machine, one uses the standard welding hose that is fitted with a 1/4inch quick-connect coupling to connect the gas cylinder to the machine with the exit/outlet pressure at the gas cylinder maintained at less than 60pounds per square-inch(psi). Also, the EVAP testing must be done indoors where the stable ambient air allows for smoke to leak out gently without being blown away hence aiding the user to locate the leak. There is also a safety precaution related to EVAP testing. When doing the EVAP test, the user must wear a vapor mask which prevents him/her from inhaling the vaporized oil mist, as well as ensure that there is no-one else in the enclosed workroom.